Fit for Success: "Run For Your Life!!!!" Last weekend I had the opportunity to try something totally out of my comfort zone. 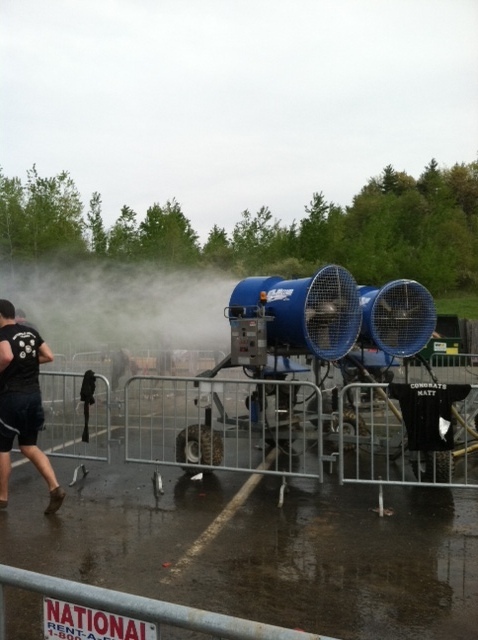 Not only was this a new way to get in an awesome workout, but I had a BLAST! I ran the "Run For Your Life" Zombie Race 5k. This was an obstacle course where "zombies" chased after us through hills, streams, woods, and LOTS of mud!! We wore belts with 3 flags (think flag-football style) and the object of the 'game' was to get out of the race 'alive' by running from the zombies and not allowing them to take your flags. Obstacles consisted of sprinting up a hill of mud, army crawling through sand, running through a maze (filled with zombies of course), finding your way through a fog-filled room, crawling under "barbed wire", and making your way through miles of mud. 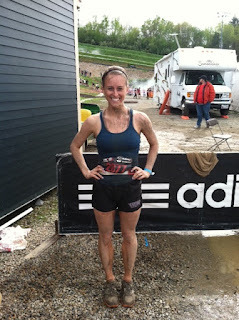 Unfortunately, I "died" since all my flags were taken, but I got in an incredible workout by crawling through all of that mud! It was such a blast, and we got to end the race by sliding down a massive slip-n-slide down the hill..... Into a pit of mud and water. It was awesome!!!!!!! 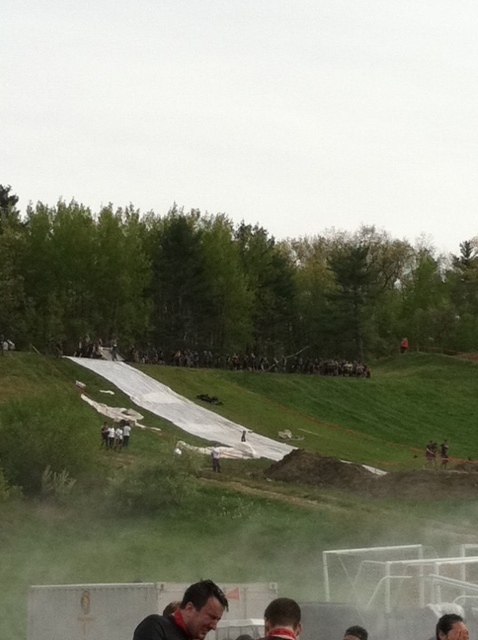 the "wicked" sick slip-n-slide, complete with a mud pool at the end! 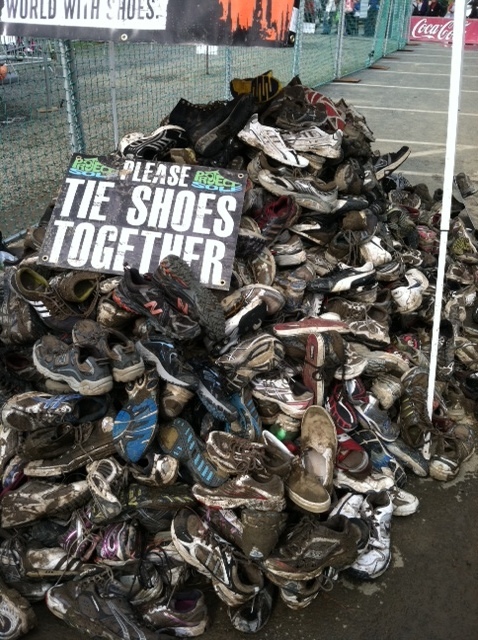 all of the ruined shoes! 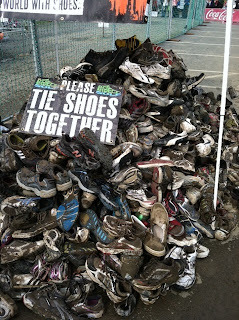 luckily these are all cleaned and donated to less fortunate countries! 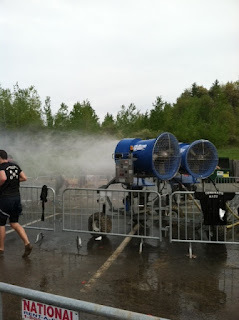 the snow blowers that "decontaminated" us.. it was FREEZING! I had never done anything like this, but it was so much fun! Which leads me to the point of this blog. As I've said before, get out of your comfort zone and try something NEW!! Doing the same ole workout routine can get so generic and boring.... And can lead to lulls where you have no desire to exercise. By trying something new, you might find a new hobby, or you will just get in a great workout, or you will just be able to enjoy time with a friend! 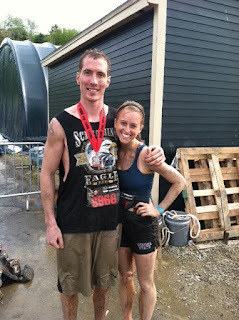 I ran with my friend Vince from work! So get out of your comfort zone and have fun! 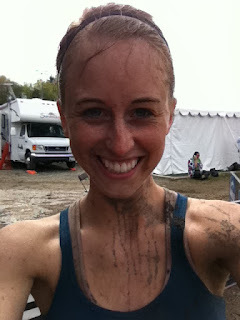 well... at least they say mud is good for your skin?? !